In 1929, a loose collective of young German filmmakers working their way up the ladder of the German studio system took the reigns of a low budget production about a group of attractive young Berliners who meet up for a Sunday outing to lakes. They shot on the streets of Berlin and the parks and beaches of Wannsee on a minimal budget with non-actors (all playing variations of their real selves, right down to their names and occupations) and whatever equipment they could scrounge together, from rough script from which they improvised freely on location. 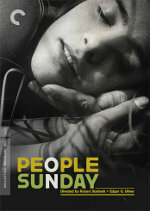 People on Sunday is, in its own words, “a film without actors.” More than that, it was a film without a studio, a production without studio backing or distribution in place, shot on weekends with volunteer cast and crew: the very definition of independent filmmaking. But if the actors were all amateurs, the filmmakers were, to greater or lesser extent, professionals toiling at the lower levels of the film industry. This film was their chance to show the industry, and themselves, just what they could do. Released in 1930, People on Sunday–one of the final expressions of the silent era in an industry giving over to sound cinema–became a surprise hit, a highly influential film and, over the years, something of a legend, as it was almost impossible to see in the United States for decades. And reputation aside, the collective that made it include some pretty significant names: Robert Siodmak and Edgar G. Ulmer shared director credit, Billy (listed here as Billie) Wilder is credited with the script, “from a reportage by” Robert Siomak’s brother Curt (credited here as Kurt) Siodmak, with the legendary cinematographer Eugen Schüfftan behind the camera and Fred Zinneman assisting. That line-up alone (which includes more than one future Oscar winner) made the film a kind of grail for fans of classic movies and film history. The inventive filmmaking, breezy pace, light touch, luscious images and gentle, appreciative spirit of the film makes it a classic.